Okay, I need some help in understanding something and that is racism and hatred in general. Not the what but the why. As a white police officer working the inner city, I experience racism nightly but not in the way most of you all might expect. My officers and the the other officers on my department are professional and deal with people fairly and equitable. The racism I experience is FROM minorities. It's not uncommon to be called a "[expletive] white cop," a "pecker wood" (derogatory term for white people) or to have the n-word thrown about from black people describing other black people. With the election of President Obama, we heard it all. From drunks, drug dealers, and wife beaters I heard, "Oh things are going to change. You won't be able to harass us now because we got ourselves a black president." I like to point out, being the smart alec that I am, that President Obama is half white. Oh man! That ticks them off. Then a couple weeks ago the nation was exposed to an incident that happened in Cambridge, Mass because of a question that was asked at a nationally televised presidential press conference. Police were dispatched to the home a Harvard Professor Henry Gates Jr. in regard to a burglary in progress. The police arrive and simply ask Professor Gates for identification to prove he lives there so they can be on their way. Prof Gates, obviously an educated man, starts a racial tirade after refusing to provide identification that shows he lives there. The discussion moves outside and he is arrested for disorderly conduct (a charge which is later dropped). Why the question of a local incident is posed to President Obama I do not know. But President Obama, showing Joe Bidenesque qualities in his answer, says that he does not know what happened but that the police acted "stupidly." Why? Why? Why would the president throw down the race card about an incident that he does now know the specifics about? For someone who is supposed to bringing people together he certainly seems to be a divider and makes my job more difficult. Now all the minorities who happen to be burglars, robbers and other racists think they have an ally in the White House because we are only targeting them because of their race. 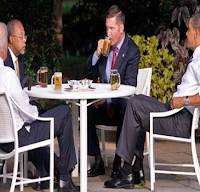 So last week, President Obama, Vice President Biden, Professor Gates and Cambridge Sergeant James Crowley had a meeting "over some beer." The results were an "agreement to disagree." You are trying to tell me that no one could admit that maybe mistakes were made?? Maybe the situation could have been handled differently by Sgt. Crowley. Maybe the situation could have been resolved by Prof Gates by simply showing identification so the police could move on? Maybe a comment by the president saying that mistakes were made but racism doesn't seem to be the cause. No, President Obama, who has made a career of hanging out with professional racists such as Rev Jeremiah Wright, leaves the race card out there instead of doing the right thing and bringing it back. In the end, I am left wondering, what in the human mind, causes such hatred and venom be spewed towards another group of people, whether it be because of race or religion. I understand hatred if someone has personally offended you and even then we are called to forgive them. I think we are all called to love one another. We are made in the image and likeness of God. God is love. Isn't it easier and more calming to love someone than it is to expend the energy to hate them?? I've been disturbed by many of the same things that you're talking about here. Whether it's racism or "reverse racism" (which is still racism), it makes me feel quite sad. And I feel sure that it makes God feel even sadder. In somee cases, I think it's ignorance. In some cases, it's been taught. (I had a family member 2 generations older than I who used to tell the most fantastic and, to me, scary stories about black people. It took me a while to realize that his stories were utterly false.) And in some cases, I think it's a way for an insecure person to feel superior. Resentment is like taking poison and waiting for the other guy to die. The same applies to racism, I think.